Recently, we were asked to carry out a refurbishment of multiple rooms for a local electrical manufacturing company. Here’s what we did. The refurbishment was to include the boardroom, executive toilets and the executive hallway with multiple changes throughout each room. 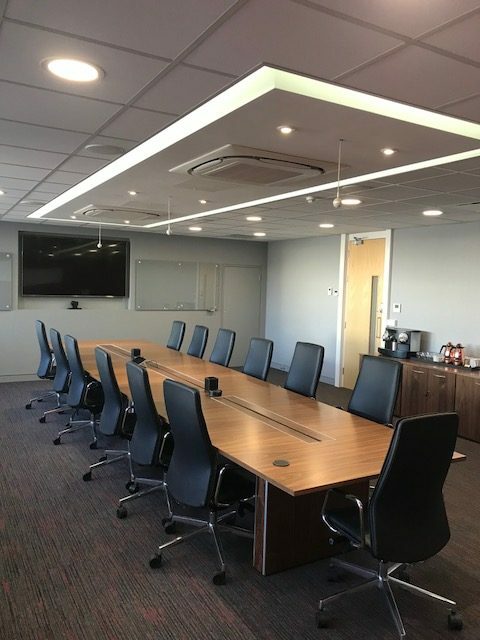 The boardroom benefited from new carpets, new blinds and new secondary double glazing to keep noise to a minimum throughout conference calls and meetings. 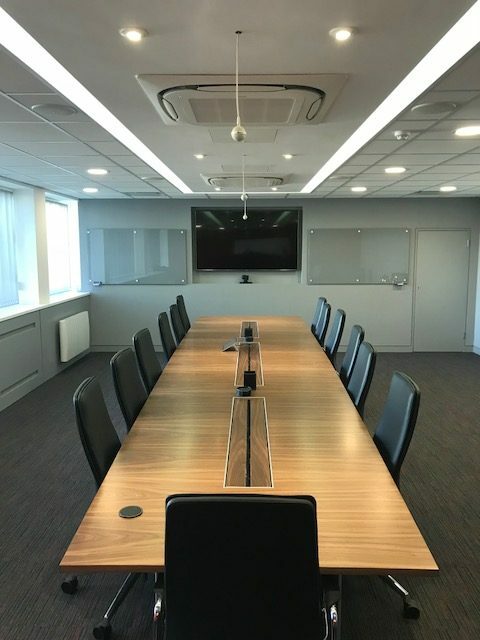 This was complemented by the addition of a new acoustic wall and the installation of a new high specification audio/visual set up with surround sound, ideal for video conferences. We added a new 3 piece Walnut veneer boardroom table with full cable management. This ensures cables stay tidy and hidden down through the table legs and into floor boxes. We also added a matching veneer storage unit with integral fridge and included high back leather executive chairs to create a modern and professional feel. 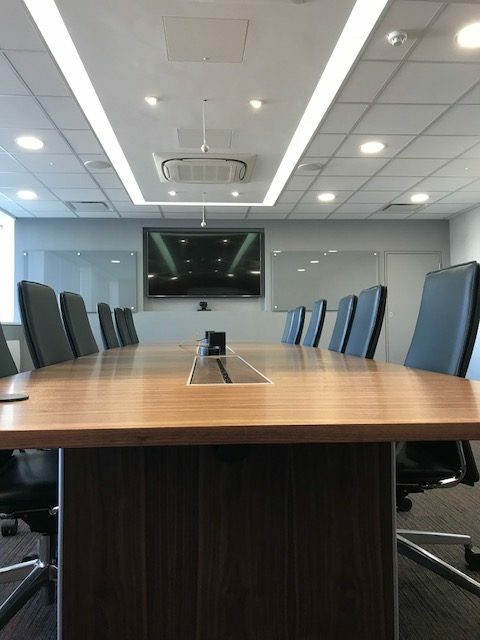 The finishing touch to this room came in the form of a new ceiling with a recessed feature light above the boardroom table. 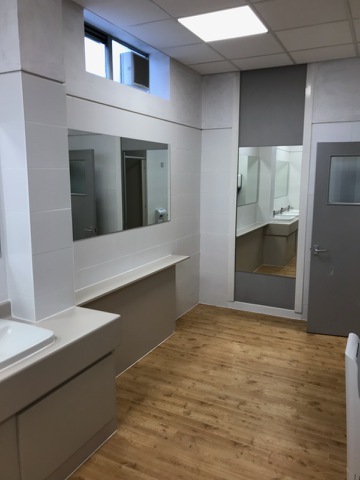 We were also instructed to carry out a refurbishment of the executive toilets. 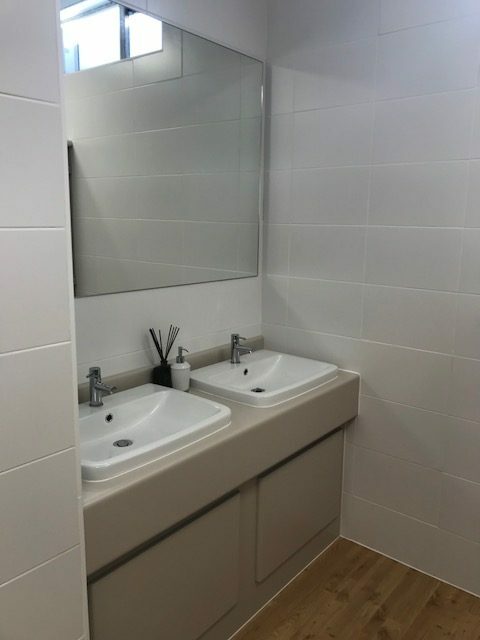 Here, we replaced all old porcelain, cubicles and tiling and added new flooring for a fresh look and feel. The executive corridor was also refreshed with new Ash doors, LED lighting and a new ceiling grid and tiles.